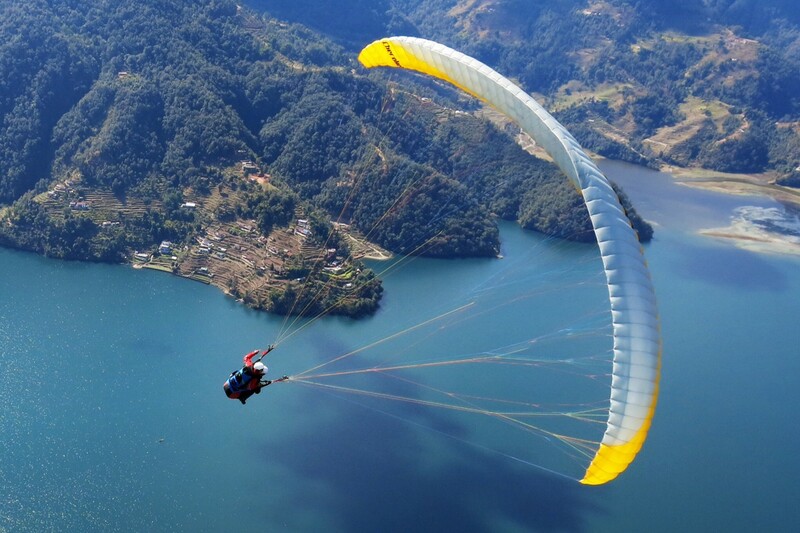 Paraglide over Pokhara in Nepal and take in some breathtaking views, hike up to Sarangkot for some mountain backdrop and raft through some exhilarating rapids. Take a little taste of everything Nepal has to offer on this short adventure getaway. Kathmandu is like no other city, so get lost in the hustle and bustle of Thamel and explore the Temples that are symbolic for Nepal’s Hindu community. Take a short hike up Sarangkot hill and spend the night in a traditional Nepali mountain tea house. Wake up early the next day and watch the sunrise in the beautiful mountain range backdrop. Today we arrive in Kathmandu City – the urban core of the Kathmandu Valley in the Himalayas – and check in at a cozy hotel located right at the centre of all the action. Afterward, we’ll be visiting Swayambhunath (a.k.a. the Monkey Temple) where we get to interact with the monkeys! After an early breakfast, we’ll drive to our starting point where we’ll begin rafting for 2-3 hours on exhilarating rapids. We’ll then drive to the city of Pokhara where we get the chance to view the natural beauty of this area before spending a leisurely rest of the day. After a hearty breakfast, we’ll head out to an adrenaline-pumping paragliding session as we fly over some breathtaking scenery. We will then start our hike to Sarangkot hill in the afternoon. This hike is known for its spectacular mountain scenery and panoramic views of the surrounding mountain skyline, home to 3 of the highest mountains in the world! View the natural beauty of Pokhara Valley and sleep at a lodge on top of the hill with some views to die for. Rise and shine, Guanabanas! We’re taking a short hike up the hill to watch the magnificent sunrise over the Himalayas before breakfast. Next we get the option to either walk or drive back to Pokhara before heading out for a half-day sightseeing tour of Bindhyabasini Temple, known for its fabulous view of the city and mountain ranges. Catch a glimpse of the unique Davis Fall, home to the legend of the Devi’s fall (be sure to ask about the legend when we get there), before we head to the illustrious Gorkha Museum that represents the mountains, people, and the area’s environment. After the sightseeing tour we have a one-hour boating trip then free afternoon where we can enjoy the town's nature or even come back with a few Nepali souvenirs. After breakfast we’ll drive back to Kathmandu and visit the stunning architectural beauty that is Pashupatinath Temple, where many pilgrims from all over the world come to pay homage, as well as the Boudhanath Temple. We’ll then head back to the hotel for our final overnight stay. Today we’re being transferred to the airport to catch our flights back home. This price is based on a minimum of 4 participants. Arrival, departure, and all transport in a private (non-A/C) car. International flights to/from Kathmandu, Nepal.